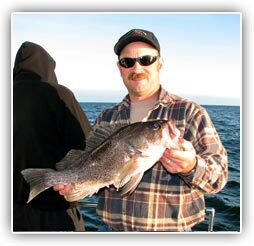 Fish the waters of the Pacific Ocean off the coast of Washington State's Olympic Peninsula or enjoy great fishing in the Strait of Juan De Fuca. La Push, Neah Bay, Sekiu, & Clallam Bay. I have been fishing these waters since the age of 10 and I know them intimately. I was born in Wisconsin and when I was 4 years old my parents came to Washington to visit my mom's sister and they fell in love with the area. Upon returning from there trip they auctioned off everything and we were on the move. We moved to Washington in 1968 and this is were I grew up and call home. I went to the Forks schools from kindergarten though the 12th grade.Graduated with honors and went to a trade school for computer programming. I fish the deeper holes but you have to have flow to make them work and dive well. Tolling for kings I like to have a 1.8 – 2.0 knot speed. I like to use Hotspot flashers and hoochies (imitation squid) or spoons. One of my favorite hoochies is the green splatter back, the Seahawk (green & blue) purple haze with a white glow flasher is also productive. I do use a lot of others but these are my favorites. 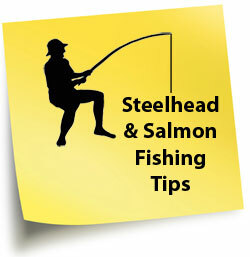 Side drifting is one of the most popular methods in conventional steelhead fishing. This can be done with bait, yarn and rubber worms. This method runs your gear alongside the boat for a longer, more natural looking presentation. On my guided trips I set up my gear the same from the line on the reel to the amount of lead and the leader. The video above was shot in October of 2008. Click here for more details about this trip and see some great still shots, too! Fishing for sea bass is easy for all members when we find a school of bass we lower jigs to the bottom and real them up or cast plastic on lead heads either way its fish on. 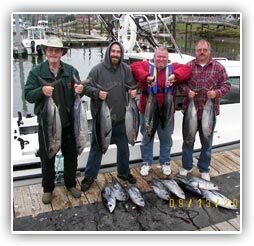 Scenic Ocean and River Tours are also available, be sure to bring your camera, the scenic beauty and wildlife of Washington's Coast is unbelievable. The gray whales will be off the WA coast in April. Later in the summer we will see the humpbacks like the one pictured here.